It is most efficient, but typically also more costly to build transit underground. If we take advantage of the existing highway trench, it will be easier to underground high quality transit. 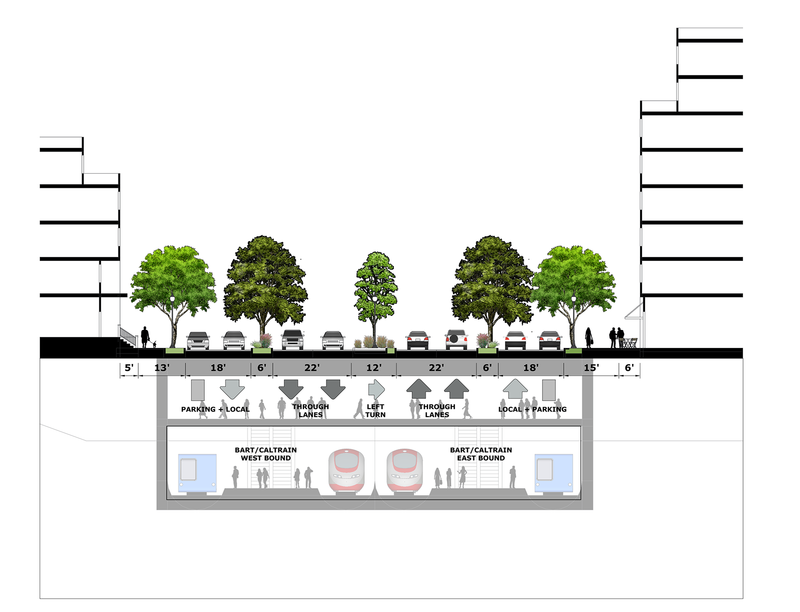 It will be vastly less costly and complicated to backfill the ROW and leave the necessary widths for the future transit lines in place, and, by enabling multi-level capacity, we can exponentially increase the amount of travelers the ROW can accommodate within a smaller space. 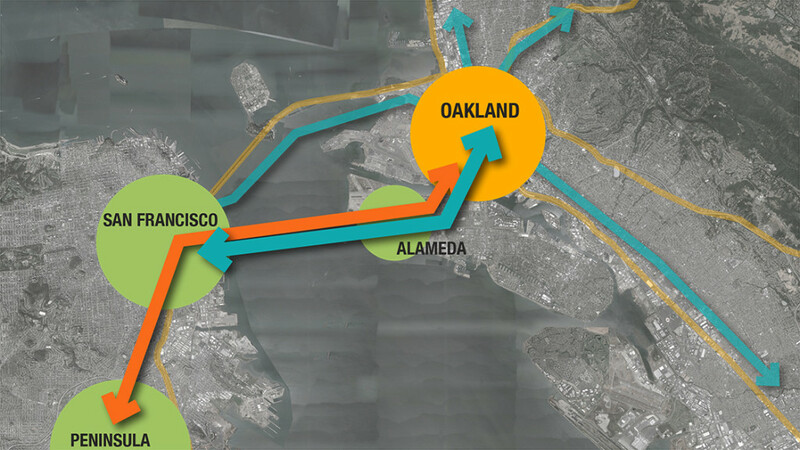 The concept can increase regional mobility options by providing East Bay access to Caltrain and HSR; these two rail agencies will gain access to the East Bay population while enabling convienient interline connections throughout the Bay Area and California. A second transbay crossing is critical to our regional mobility and growth needs. I-980 was originally designed to connect to a second Bay Bridge crossing, so its location was already studied and identified as desirable for this future connection. 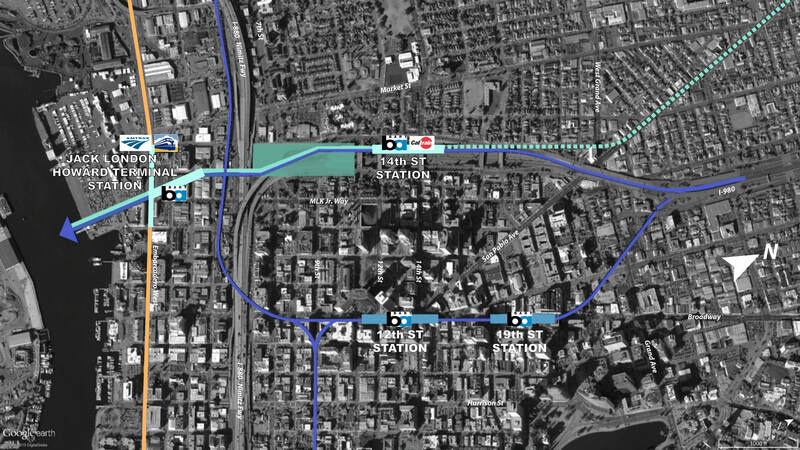 Using I-980’s current subgrade condition will avoid costly tunneling to a new second transbay tunnel from Oakland, but also will take advantage of an existing transportation corridor that allows the extension of BART south from MacArthur to occur without the need to create a new, costly corridor from scratch or take any private property. By implementing the second crossing the Bay Area will seamlessly connect East Bay residents to jobs in San Francisco and beyond with the potential for seamless transfers between Caltrain and BART and enable long-needed 24 hour BART Service. By using the I-980 footprint to build a strong foundation of regional mobility, we can more than double the capacity of the existing freeway in a smaller footprint.